Moving the Needle: Rajai Davis breaks the tie with a two-RBI double in the eighth, +.342 WPA. Up 2-1 in the seventh, the Jays tacked on another three to take a 5-1 lead, which, against the Mariners, is as close to a lock as it gets. But they pulled off the comeback in the eighth when two singles and a walk loaded the bases for Miguel Olivo. On a 1-0 pitch he whaled one over the wall in center, tying the game in one swing. It wouldn’t last long, though. In the next half inning Davis smacked a triple into the gap, bringing home both base runners and giving the Blue Jays a 7-5 lead. Mike McCoy: 2 for 2, 2 2B. I’m sorry, but there’s really nothing substantial to say about McCoy. Good game, though. Jose Bautista: 1 for 3, 1 2B, 1 BB. The walk was intentional. He also picked up an RBI on a sac fly. 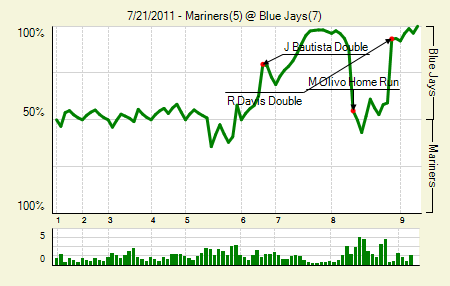 Moving the Needle: Mitch Moreland strikes out with the bases loaded in the sixth, -.122 WPA. Down 1-0 — on account of their center fielder dropping a fly ball in the sixth – the Rangers loaded the bases with two outs. On a 2-2 count Jered Weaver blew away Moreland with a fastball high and away, ending the threat. 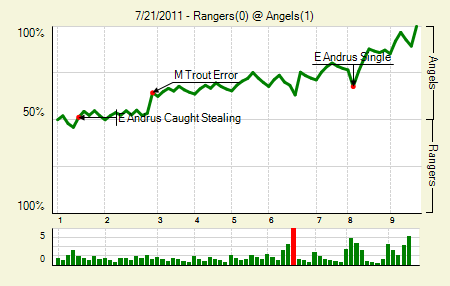 The Rangers did put a few more runners on before the end of the game, but they never got anything going against the Angels pitching. Jered Weaver: 7 IP, 7 H, 0 R, 2 BB, 6 K. He has allowed just five home runs this season in 154 IP. C.J. Wilson: 8 IP, 2 H, 1 R, 1 BB, 8 K. Here’s my problem with W-L for pitchers. Why the need to assign Wilson a L here? You want to give the pitcher a point if he pitches really well and his team wins? Go ahead. But I don’t see what anyone gains when we debit pitchers who throw games like this. 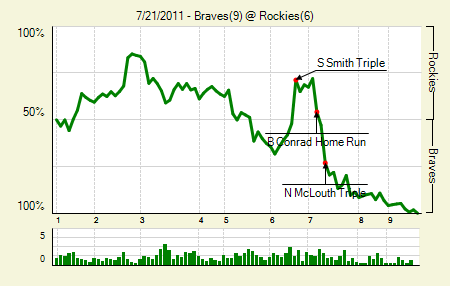 Moving the Needle: Seth Smith triples home a run to tie the game, +.234 WPA. The top two plays, in fact, were RBI triples. The first came from Smith, who lined one down the right field line and into the corner in the sixth. The hit brought home Troy Tulowitzki to tie the game at five. But in the seventh Nate McLouth added a triple of his own (+.202 WPA) to bring home Alex Gonzalez and give the Braves a 7-6 lead. They picked up a few more that inning, which made the endgame just a little easier. Jason Heyward: 2 for 5, 1 HR. He drove in three. I love it when there’s a minor controversy over an awesome player, and he responds to it by proving to you how awesome he really is. Carlos Gonzalez: 1 for 2, 1 HR. He had only two at-bats, because he left the game after feeling pain in his wrist. He felt it on a swing, which wouldn’t be good normally, but is all the worse because he suffered from wrist issues earlier this month. 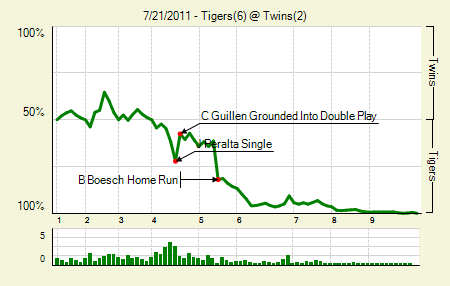 Moving the Needle: Brennan Boesch’s two-run homer puts the Tigers up by three, +.207 WPA. The Twins brought some excitement this week, coming back twice against the Indians. They weren’t so fortunate against the Tigers. In the fourth they escaped a bases loaded, one out jam with only one run allowed, thanks to a double play. In the fifth, though, Boesch crushed a Carl Pavano offering to make the score 3-0. The Tigers would then add another pair in the sixth on their way to a big win. Justin Verlander: 8 IP, 5 H, 1 R, 0 BB, 9 K. Lower your walk rate, change your life. Verlander is currently walking a full batter less than his career rate (which was also the same as his 2010 rate), and his results are all the better for it. That’s the 14th time in 22 starts that he’s recorded at least one out in the eighth inning. Jhonny Peralta: 3 for 4, 1 2B, 1 HR. He drove in three. His .385 wOBA is second among MLB shortstops (1st in the AL) and 21st in all of baseball. Moving the Needle: Omar Infante’s two-RBI triple brings the Marlins to within two, +.151 WPA. 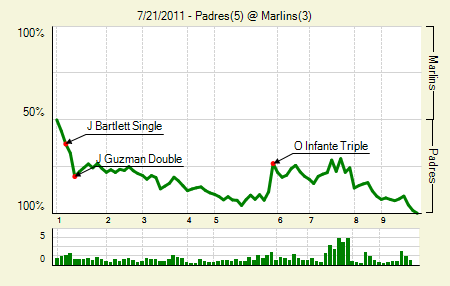 The Padres scored three runs against Javier Vazquez before making an out, and had a 5-0 lead after five. It could have been worse, too, as they had the bases loaded in the fifth, but managed only a single run when Chris Denorfia walked. The Marlins showed some life in the bottom half, putting two on and then scoring on a single. Infante then tripled into the right-center field gap to bring around his two base runners, making it a 5-3 game. But that was as close as they’d get. Cameron Maybin: 4 for 5, 2 SB. His aggressive base running helped him score a pair of runs. Will Venable: 2 for 5, 1 2B. He’s no great shakes, but it’s not surprising that he hit well on the road in the last two games. As one commenter has been tenacious in noting, he’s quite a better hitter on the road (.326 wOBA) than at home (.270 wOBA). But I’ll repeat, he’s no great shakes. 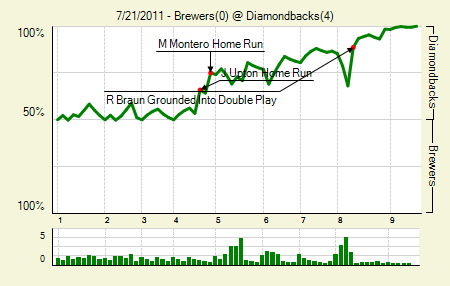 Moving the Needle: Sam Fuld drives home an important second run, +.126 WPA. 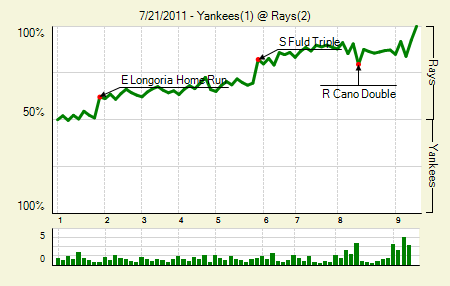 Runs came at a premium during most of the Yankees-Rays series. The Rays got one in the first on an Evan Longoria homer, and in the fifth they got one when Elliot Johnson walked and Fuld tripled him home. It gave the Rays enough cushion to take the game and finish with a series split. James Shields: 7.2 IP, 6 H, 1 R, 3 BB, 6 K. He’s having by far his best year, and his name has come up prominently in trade rumors this week. It would seem like a Tampa Bay move to dish him in the next nine days. CC Sabathia: 8 IP, 5 H, 2 R, 4 BB, 8 K. One of the walks was intentional. In his last six starts he has raised his K/9 from 6.63 to 7.91. 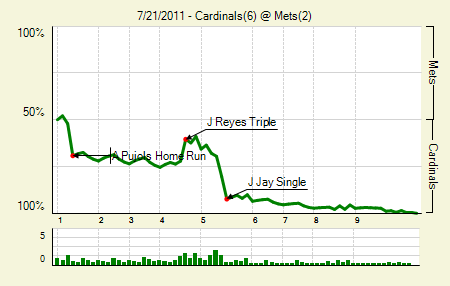 Moving the Needle: Albert Pujols strikes first with a two-run homer in the first, +.171 WPA. The Mets won the day before after trailing 2-0, but they wouldn’t be so lucky in this one. In the first, with a man on second and one out, Pujols hit a towering shot that hit the face of the second deck in left. The Mets closed the deficit in the fourth, but then the Cards charged for three more in the fifth and avoided the series sweep. Jake Westbrook: 8 IP, 4 H, 2 R, 1 BB, 3 K. It seems that every Cardinals trade rumor I read mentions that they’d like a starter to replace Kyle McClellan. But this start aside, is he really that much more of a liability than Westbrook? Moving the Needle: Justin Upton breaks the scoreless tie in the fourth, +.125 WPA. This one looked like a replay from the Home Run Derby. With the score tied at zero in the fourth, the DBacks turned Upton loose on a 3-0 count, and he rewarded them with a tape measure shot. Miguel Montero followed later in the inning with a solo blast of his own. That’s what powered the Diamondbacks on their way to a series split. Ian Kennedy: 7 IP, 4 H, 0 R, 2 BB, 5 K. He has a pretty insane reverse platoon split this year: 2.71 FIP and 3.11 xFIP against lefties, 4.39 FIP, 3.96 xFIP against righties. Zack Greinke: 7 IP, 5 H, 2 R, 0 BB, 7 K. The solo homers were the only damage. We hoped you liked reading The Morning After: Game Recaps for July 21st by Joe Pawlikowski!